It has been ages since I’ve been pregnant. When I was pregnant with Amira, I wore chunky sweaters and leggings and scrubs. I had the hardest time finding maternity options that were chic. The only thing I saw in stores were big mumus or rouched shirts. But, what a time in maternity style to be expecting. Maternity options stylish yet functional now. The styling options are perfect for individual tastes. A look that I am loving while pregnant is the Canadian Tux. The Canadian Tux is a simple outfit consisting of denim wear for both tops and bottoms. You may sometimes hear it as Denim on Denim. It is just a jean jacket and jeans or denim blouse and jeans. Either way it is paired, I love the look while pregnant. One reason is I finally found the perfect pairs of maternity jeans that fit my petite frame and growing belly. Plus side of it they are not boot cut. Man the days of shopping for maternity jeans with Amira were racks of early 2000s boot cut jeans. Brands such as Isabel Maternity for Target design the cutest and functional maternity jeans. These distressed crop jeans are perfect for a day look and even switching it up for date night with hubby with a cute pair of heels. The best thing about them is the maternity panel that grows with your belly during pregnancy and even post pregnancy. 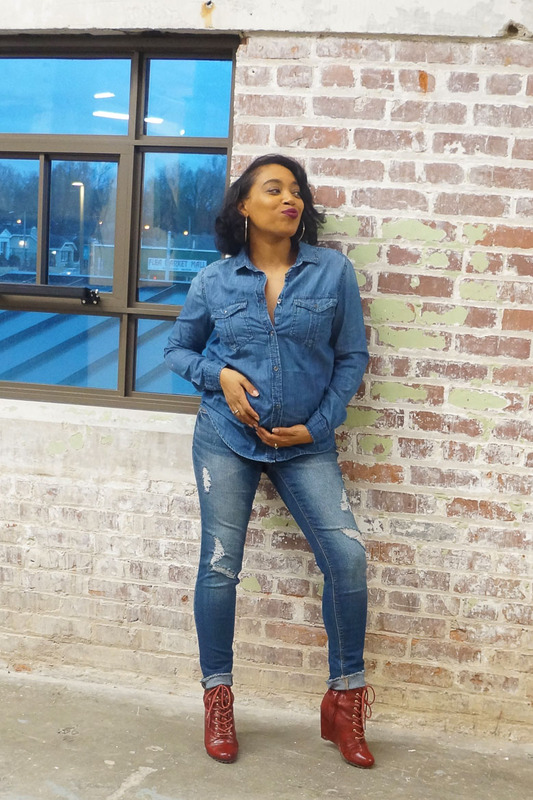 There really isn’t a “wrong” way to style the Canadian Tuxedo look while pregnant. Remember you do have styling options though that can really elevate your look. Go for bold accessories in your shoes, accessories and especially a handbag. I also love to add more depth to the denim on denim look by pairing varied shades of denim. I always for either a darker top or darker bottom with a lighter shade of the other. You can always break up the denim as well. Pair a chunky sweater or layer with printed tops or vest over your blouse or jacket. Why Working While Pregnant is Important to Me?